Candy Crush, we'll miss you. Considering all the time we spend on our phones these days, we don't always think about how that ubiquitous piece of technology is making us feel. And as it turns out, it's making us feel A LOT. Time Well Spent, a company dedicated to designing technology that doesn't "hijack our minds," put out a survey along with Moment, an app that tracks how much time you spend on your phone (yeah, we're a little scared to check those stats too), asking 200,000 iPhone users for feedback about the apps on their phone. 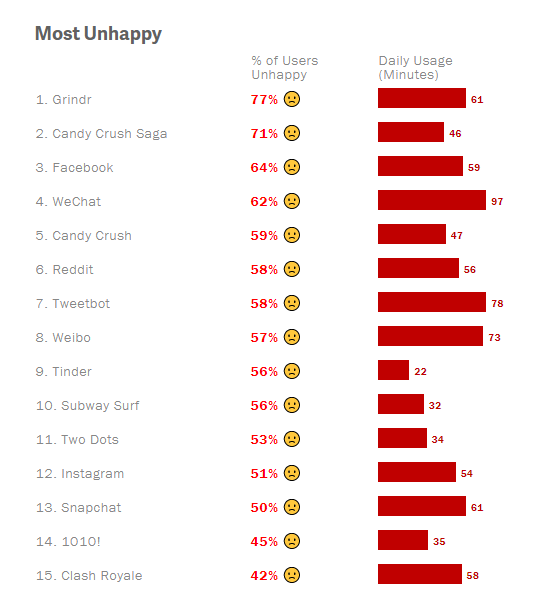 They found plenty of specific results, but one overarching one: the more time an app demands of us, the more unhappy we are using it. 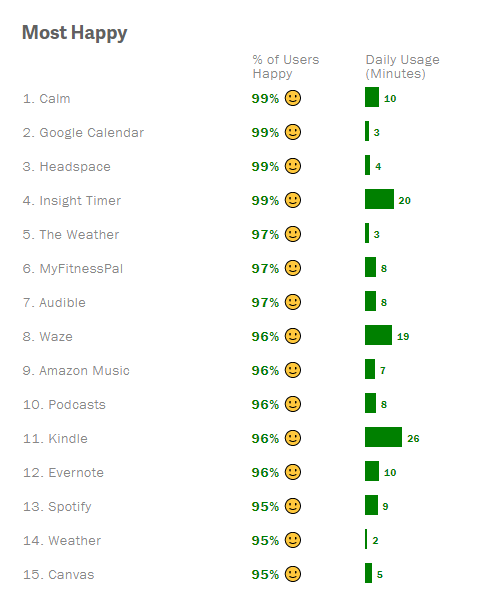 While the survey doesn't offer an analysis of the results, Time Well Spent's general hypothesis is that any technology designed to keep you glued to your screen will sap your willpower and make you less present. Meanwhile, an article about Candy Crush (one of the worst offenders) from 2014 in the Guardian notes the addictive tendencies of the game, and how its specific design leaves the user always wanting more. It's a similar story for dating or hookup apps — as the Advocate wrote last year, "In much the same way that fast foods offer quick, easy satiety or comfort but can damage the body via refined sugars, sodium, and cholesterol, hookup apps offer quick connection but can damage the psyche — and the body." So what's a smartphone-lover who still wants free will to do? Well, Time Well Spent suggests turning off notifications entirely, and keeping only "tools" on your home screen, so you're not tempted to open up the apps that make you unhappy. Thrillist, meanwhile, recommends never using your phone as an alarm clock (because it leads right into mindless scrolling first thing), using airplane mode liberally, and a few other useful hints. The point? Remember when you're spending time with your phone, you're spending your time. So decide if what you're doing is worth it, and go from there.